Best Known For: Jean-Paul Belmondo is a French film star, unconventionally handsome, he became the antihero of the French New Wave cinema movement. 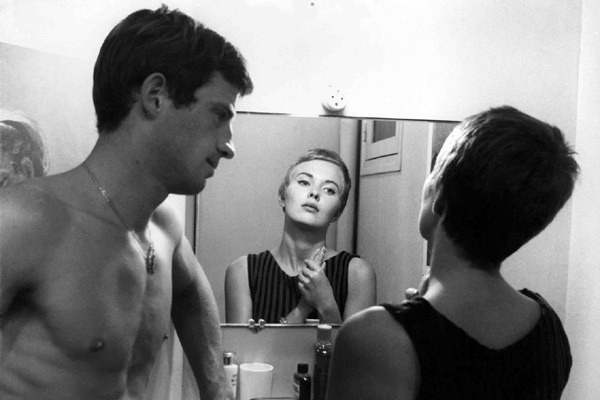 Jean-Paul Belmondo earned international fame in Godard’s 1960 film Breathless. By 1965, he had acted in 25 films. He continued with portrayals in Pierrot le Fou, Mississippi Mermaid and Les Miserables (1995). Suffering a stroke in 2001, he did not return to the screen until 2008. Making your look appear effortless actually takes a little bit of effort. He often wore a half-undone collared shirt and worn-in driving moccasins. Roll your shirt sleeves, undo a couple of its buttons, and skip the iron for the Belmondo look. The 1960 film Breathless was acclaimed as much for its mastery of popular new-wave cinema as it was for Jean-Paul Belmondo’s breakthrough role and sense of style. Belmondo’s irreverence as a thug running from the law created a new type of leading man on screen. Everything he wore was critical to developing a brazen character who appropriately modeled himself after Humphrey Bogart, who himself was such a trendsetter that a variation on the fedora bears his name. However, Belmondo’s look is no copycat. It belongs in a class all its own. Clad in trim trousers, a blazer and a fedora while dangling a never-ending cigarette from his mouth, he epitomized French street style in every possible way. It’s a look that, when worn today, is completely carefree while still being fashion conscious. At its heart is a feeling of adventure that comes from looking like you didn’t try too hard. Belmondo, in a way, has come to represent a style that is perfectly imperfect. Still, Belmondo’s real status as a style icon comes from an unwavering confidence that’s just shy of cocky. He could have been draped in a burlap sack, but his swagger made anything he wore look cool. Most people believe that a suit is the only thing that truly makes a man look handsome, but Belmondo was equally as dashing in the simplest of clothes. He often wore a half-undone collared shirt and worn-in driving moccasins. It was the perfect combination for kick-starting a Vespa and driving off into a Provencal sunset. Ironically, the trouble with making your look appear effortless is that it actually takes a little bit of effort. This is not about looking like you just rolled out of bed to grab the first thing in your closet or, for that matter, off your floor. Your goal should be to put a cohesive look together that doesn’t look overworked. A few key additions to your wardrobe will help do the trick. The truly fashion-forward can go against the mainstream and dive directly into a double-breasted blazer. It’s a risky move, but a well-tailored one sans shoulder pads and paired with dark denim updates a classic without looking like you were plucked from 1985. If the blazer is too much for you to handle, try a double-breasted trench coat, like the Burberry Trench Style Raincoat. Just be aware that this is not the bulky, calf-length variety. It should be deconstructed, lightweight and cropped at the thigh or just above the knee. You can throw it over anything — even that T-shirt that was in fact laying on your floor — and look pulled together without exerting too much effort. For a more relaxed slice of Belmondo styling, you could opt for a simple white button-down shirt. Just make sure to keep it comfortable. Roll the sleeves, undo a couple of buttons, and skip the iron. Anything too labor-intensive just isn’t Belmondo. Jean-Paul Belmondo: Style Icon – AskMen.